Please Note: The following reprinted content was before MK Davis's assertions of the Bluff Creek Massacre and although most disagree with MK's assertions (we do anyway), this post is more about the Patterson/Gimlin Film and Thom Powell's ponderings of the possible human-ness of Sasquatch. On the heels of the anniversary of the Patterson Gimlin film (OCT 20) We found this insightful remark from Thom Powell on Cryptomundo. It is a response to an M.K. Davis Presentation at Don Keating’s Ohio Bigfoot conference on May 17th, 2008. There is no doubt M.K. Davis has made his mark in the Bigfoot Community, for better or for worse. Most would say for the worse. Once heralded as one of the greatest contributers to analyzing the Patterson/Gimlin Film, his theories became controversial when he began to assert he had evidence for a Bluff Creek Massacre. 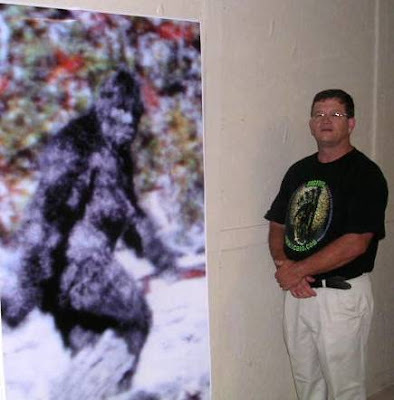 Days before he announced the "massacre", at Don Keating’s Ohio Bigfoot conference on May 17th, 2008, MK presented other less controversial assertions. These assertions supported the more human-ness of the figure of the Patterson Gimlin film, including the possibility of a top-knot and ponytail. Although there was the back and forth that can be emblematic of our Bigfoot community, we like Thom's response to the presentation in general. Instead of entering the fray of whether or not Bigfoot is human or ape, capable of braiding its hair or not. Thom provides the sanity of context and asks us not be afraid to look past our assumptions. 1. the creature shows a number of hair stylings like a top-knot. He concludes it’s not a saggital crest on the subject. It is a top-knot of hair. He shows his detailed analysis that supports this view and it is more compellling than most realize. 2. There is also evidence of braids and a ponytail in the head hair. These are utilitarian hair styling that are commonly used in modern and ancient tribes to keep hair cleaner and out of the way. On this basis Davis asserts that the PGF subject is closer to a vestigal member of a Native American population, not an ape. This is the essence of the assertion that the film shows a human being. 4. Most reproductions of the PGF have been darkened in the reporduction process. The closer one gets to the original film, the lighter the creature appears and the thinner the hair appears to be. This shows better views of the body outline beneath the hair/fur. Enhancements Davis performed show the breasts and facial features more plainly and definitely. His enhancements show more ‘humanish’ facial features than the animalistic features that other researchers contend are shown in their respective analyses of available copies of the PGF. There are other interesting points about the subject and the surroundings that Davis presented. It is an excellent talk and if you haven’t seen it, you have no accurate basis to judge it. Roger Knights was at the same talk I attended so I submit that Roger’s assesments of the infromation presented are more accurate than most. Hopefully Marlon Davis will publish an monograph so more people can get an informed view of his data and conclusions. Davis is a very skilled technician and his conclusiona are fairly sound. Here in the greater Portland area there is a lot of sasquatch activity in the surrounding forests. The patterns that emerge from analysis of dozens if not hundreds of unpublished accounts does, in my view, strongly support the view that at least some of these creatures are intelligent enough to qualify as human, i.e. vestigal Indians. With this body of locally available information in mind, MK Davis’ assertions are really nothing shocking. If anything, his assertions validate something that has been argued by others for a long time: that at least some of these creatures are some form of human. Yet, the ‘ape’ paradigm still holds sway elsewhere on the continent and indeed some of these being may indeed be ape, but they probably are not all apes and I think Davis compellingly shows that the one in the PGF is not the ape that Dahinden argued, but the rather intelligent creature that Ivan Sanderson asserts. So, we’re back to the old Danhinden vs. Sanderson debate about the true nature of these creatures. Perhaps they are both correct: The bigfoot phenomenon represents multiple taxonomic grouping, as Colemen has long argued.